Choosing the right wheels for your next urban or commuter build can make the difference between a fast, responsive speed machine; and a steady, sluggish beast. Good wheels will repay their investment many times over, not only in performance terms, but also in durability. 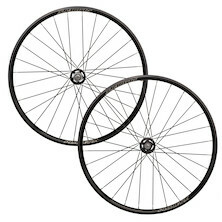 Our range of urban bike wheels sits squarely in between road and MTB; and contains affordable, high quality city-capable wheelsets for 120mm track, 130mm road and 135mm spaced MTB rear axles- in fixed, single speed and geared variations. Refined 11-speed hubs and a TIG welded lightweight rim are paired with Sapim's excellent spokes to create a robust set of road wheels that are ideal as a set of daily drivers for most cyclists. Our ever-popular alloy track tubular wheelset, with smart new graphics.